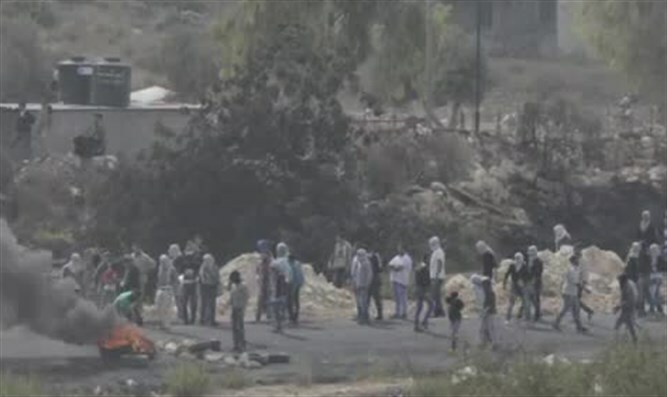 Palestinian Arabs urge confrontations with Israeli security forces throughout Judea and Samaria on Friday. The Arab Supreme National Committee commemorating the 70th anniversary of Nakba Day on Tuesday approved the activities that will begin on Friday, marking Land Day, and will culminate on May 14, the date of Israel’s Independence Day to which Arabs refer as the “Nakba”, or “catastrophe”. This year's Palestinian Arab protest marches will be held under the title "From generation to generation there is no substitute for the [right of] return and Al-Quds," which expresses Palestinian Arab adherence to the demand for the return of so-called “Palestinian refugees” and their descendants to the territory of the State of Israel. Muhammad Alian, coordinator of the committee’s activities, said that the protest activity would begin this coming Friday near the Beit El checkpoint north of Ramallah. Simultaneously, confrontations are expected at points of friction throughout Judea and Samaria. Alian added that the activity would also be in protest against the U.S. recognition of Jerusalem as the capital of Israel, its intention to move the American Embassy from Tel Aviv to Jerusalem and its decision to cut the budget of UNRWA, the UN agency for “Palestinian” refugees. The Hamas terrorist organization, in coordination with other Palestinian Arab organizations, is planning a “march of return” on Friday near the border with Israel. In a military exercise this week, Hamas sought to convey a deterrent message to Israel that it would respond to attacks on any demonstrators.